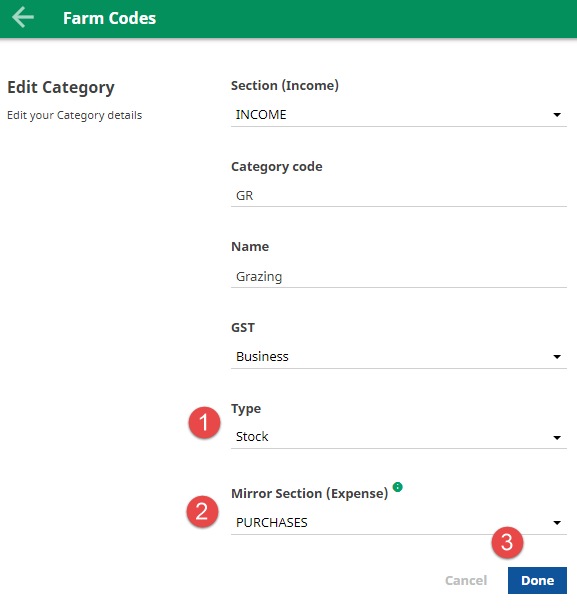 Add the livestock Category as you would for a standard code, making sure to select the correct section i.e. INCOME or PURCHASES. 1. Allocate the Type to Stock. Once the Type Stock has been selected, the Mirror Section setting will appear. This allows you to use one category and extended code for stock class sales and purchases i.e. buying and selling trade lambs. 2. Set the mirror code to be the counterpart of the section already attached to the code i.e. If you add a code under INCOME, the Mirror Section will be PURCHASES. 3. Click Done to save. 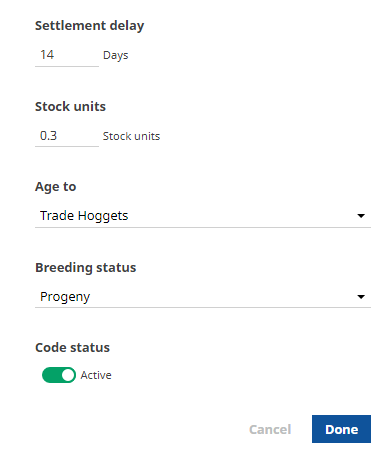 Add the livestock Extended code as you would for a standard code, making sure to select the correct section i.e. INCOME or PURCHASES. This is a timesaver as it automatically calculates the payment date when recording invoices in the Activity screen and sale & purchase events in your plan. When you enter the SU equivalent for a stock class, it calculates total SU on hand in your livestock rec. Reflects industry standards and is also for tax purposes. Your livestock numbers age up to the next stock code at the end of the farm’s financial year. MA and 2th ewes, MA cows. Ewe hoggets or R2 heifers. Animals that are born on the farm i.e. lambs, calves and fawns. Bulls, steers, rams, wethers and anything that is too young to produce offspring.